I wanted to be around crazy Italians for their first World Cup match and managed to get the tip off from my mate Chief. He said his buddy owns an Italian restaurant in Soho. I jumped on the subway and made my way down to the hip and trendy part of New York World Cup pub viewing. In this little area of downtown New York you have some of the smartest bars to watch the World Cup. West Broadway between Broome St and Grand St has all the great soccer nations represented from Brazil, Argentina and France. This is one area where you will see super hot model chicks cheering for their team. It can be a lot prettier than the fellas in a 3rd avenue Irish bar. There are moments later in the tournament when you will need those guys in their Irish pubs. You have to find a balance between venues at the World Cup. 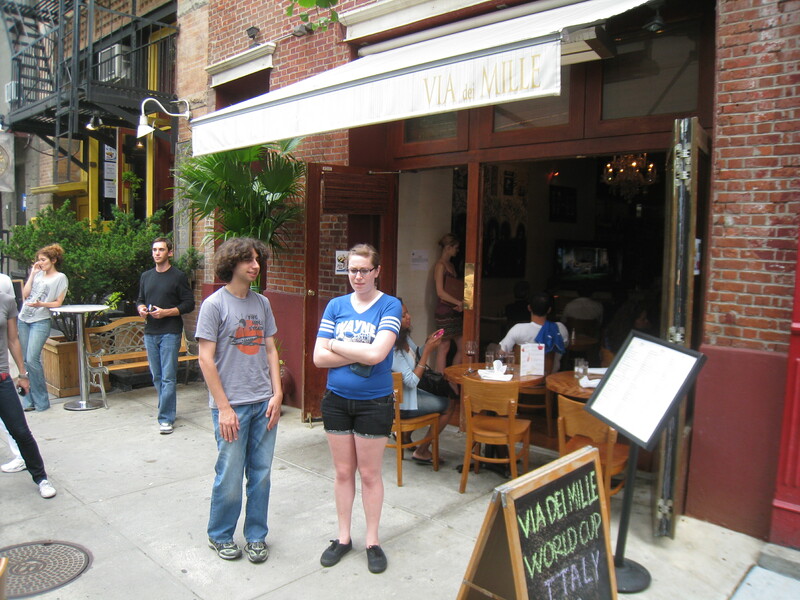 Chief’s restaurant selection for the Italy V Paraguay match led me to Via Dei Mille. I turned up 15 minutes before kickoff and got a seat easily. The waitress moved gracefully and I was sucking on a Peroni before I wiped the excitement-driven beads of sweat from my forehead. The crowd was made up of Italians from Italy, Italians from Jersey and Italians from Brooklyn. The atmosphere was party-like until Paraguay scored the first goal and the Italians went quiet. Luckily they equalized. They went crazy, with the owner of the place, Giuseppe, jumping on his own bar and screaming at the top of his voice. It’s his bar, he can do what he wants. The next Italy game is this Sunday at 10 am against New Zealand. This place would be a great venue to get in early for brunch. And if you wanted to turn it into an all day session you would just roll through that whole neighborhood to watch the following Brazil match.